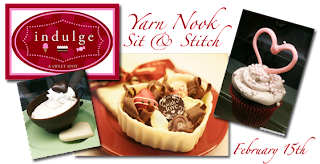 On Wednesday, February 15th (6pm - 8pm), our Sit & Stitch group will explore a new venue! We will meet at Indulge, Lafayette's first dessert lounge. We hope you will join us to knit, crochet, spin, and enjoy unique pastries, fine chocolate, and great coffee!